Water heaters are an essential home appliance that can have a huge impact on your lifestyle. Every time you take a hot shower, wash your dishes or use your washing machine, you are using your home’s hot water heater. Water heaters account for a huge portion of your home’s energy bills. On average, water heaters account for 20% of your bill. The type of water heater you choose affects more than just your monthly energy bill. It also affects your home’s resale value, your environmental impact and the safety of you and your family. Propane water heaters are a cost-effective, safe and environmentally friendly option for your home or cottage. Did you know that Propane Water Heaters can heat twice as much water in an hour than Electric Heaters? Contact us today to find out how a new Propane Water Heater can save you money. You can count on Budget Propane for excellent sales, service, and support! 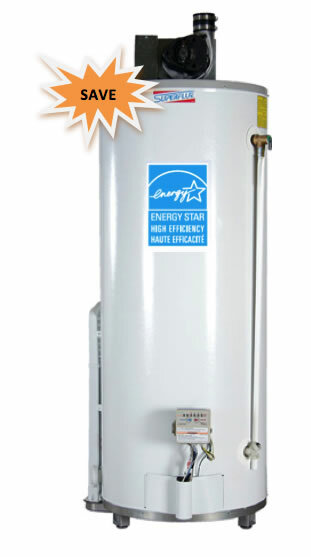 Energy Star Power Vented Water Heaters can be purchased directly from us or you can take advantage of our 36 month Lease-to-Own plan. Superflu Power Vent Water Heaters have been engineered for increased efficiency and to deliver dependable, trouble-free operation for years. A GSW Warranty covers 8 years on the tank, 6 years parts and 1 year labour.